The remarkable HARRISes, GEORGE II, ANN, and their six talented children have appeared all over Off-Off and in innumerable commercial vehicles. Read WALTER HARRIS’ picture-rich tribute to his father GEORGE II HERE. 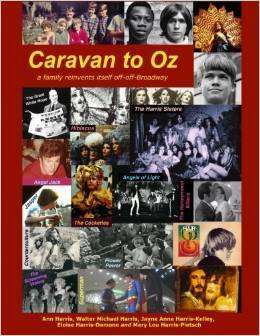 Buy CARAVAN TO OZ, the whole Harris family’s mass autobiography, ebulllient and richly illustrated, HERE. ANN and GEORGE II in “Children of Light” costumes and make-up. GEORGES ll and lll, plus Cinoites NORMAN THOMAS MARSHALL and DEBORAH LEE in RONNY TAVEL’s Gorilla Queen at Judson Church. Best-known are GEORGE III (left) and WALTER (right). GEORGE III, an Alpha male born to a performing family, started theatre troupes. Collage: top row, The El Dorado Players at La Mama (with ELOISE), and San Francisco’s The Cockettes; bottom row, The Angels of Light (with JACK COE), and a singing act with his sisters, Hibiscus and the Screaming Violets. GEORGE III was the famous blond sticking the famous flower into the famous rifle at the Pentagon. Sign for Hbiscus and The Screaming Violets (George III and his sisters). JAYNE, MARY LOU, and ELOISE continued as a singing act after GEORGE III’s death, first as The Screaming Violets, then as The Harris Sisters. The collage comparing them to priestesses from Crete hangs on my wall. TO SEE BARRY CHILDS’ HEARTBREAKING VIDEO MONTAGE OF DORIC WILSON IMAGES, CLICK HERE. ALL SLIDESHOW IMAGES CAN BE SEEN MUCH LARGER FOLOWING THE TEXT. (printed in Other Stages (NYC), March 8, 1979) A standard New York snowy city night (circa 1961). I followed Regina Oliver into the Caffe Cino to meet Joe Cino to ask him to read my play And He Made A Her for possible production. Joe (Puck personified) was busy behind the counter. He smiled, asked me my birth sign, again smiled (with marked patience) when I answered Pisces, made an incomprehensible comment to someone (Charles Loubier) in an impossible language (Simuloto), gave me a cup of cappuccino (my first) and a performance date, and politely refused to read my offered script. Regina moved me to a table. I asked her where the stage was, she pointed to an eight foot by eight foot space of open floor. Maria Callas singing an aria from Tosca ended on the jukebox, a Greek folk song began. A handsome man (Joe Davies – the father of overalls as fashion) stood to dance an impromptu, almost modest male-less-strip-than-tease. From another table, an amply structured, overtly female woman (Shirley Stoller) watched with languid disdain. (Shirley’s expression of approval – I would later learn.) The room was amber and red and warm except for a frigid table in the corner, where a neo-monastic in the sackcloth of corduroy sat reading Sartre (Robert Heide?). Four or five inadvertent impersonations of James Dean wandered in (without cause) – the one with the body (call it chance) was named Dean. With him was a walking, breathing Botticelli (Johnny Dodd). In the months that followed they would perform a dialogue of Andre Gide in very brief fur loincloths. A lovely, lavender person named Ester joined our table and was even more overjoyed at my pending production than I was. I asked Ester if she would like to read my script. She also politely refused. I asked one of Dean’s Jimmy Deans if he would like to read my script. He politely refused. Among the laughing, hopeful, winking 8 x 10’s on the wall were paintings (by Johnny India) of old men/old women sitting lonely on Washington Square benches. Perhaps they would like something to read. The Greek folk song ended. I would prefer to remember its being followed by Billie Holiday’s “God Bless The Child”. It was on the jukebox. Everything was. I had come to NYC from Kennewick, a wheat town in the banana belt (ask Michael O’Brien) of Washington State to study set and costume design. A closet dramatist from an early age, at ten years old I was writing and staging westerns in the barn of my grandfather’s ranch on the Columbia River (to the chagrin of my cousin Dan Doyle who was always cast as the dance hall floozy.) My first play, The Moon Is August (blank blank verse), was handed in as my senior composition in English Lit. Mrs. Shrieves failed me, convinced I had plagiarized it. She left me with the impression there were no living playwrights. Here I was, in the city barely a year, and about to have a play performed. A play written thanks to the unknowing subsidy of Time, Inc. who were under the naive assumption they were paying me to work for them. I hurried home to share my news with my director/roommate, Paxton Whitehead. I didn’t mention the eight feet by eight feet. The next night I took him down to the Village to see the Cino. I couldn’t find the Cino, I couldn’t find Cornelia Street, I couldn’t even find the Village. Not wanting people to think And He Made A Her was my first play to be performed, I wore three-piece suits and a trench coat tossed over my shoulder. I also drank brandy and soda. (Until the Devil and Janis Mars introduced me to stingers in the BAQ Room.) I told my good news to Bernie (noblesse oblige) Hart at the Little Bar at Sardi’s. Bernie warned me “not to get involved down in the Village – you’ll never get back uptown”. My next play, Babel, Babel, Little Tower was written for the Cino and dedicated to Joe. It made use of the whole room, from behind the counter and the toilet in back (flushed on cue) to the tables which Ralph (Paul Vincent Romeo) took away from the customers and piled on top of each other to build a tower he hoped would prove I-forget-what to Eppie (Jane Lowry). At the time, the NYPD, as happy as hornets, were busy preventing plays in coffee houses by handing out summons when not physically stopping the performance. I incorporated this living history into the climax: a coppish looking actor entered from Cornelia Street, ad-libbed a fracas with the waiter/doorman (Scotty), demanded the actors put the tables back where they belonged. The actors, led by Lady Jane, refused. Authority in blue destroyed the tower. Most of the audience thought it was for real. It was very convincing. Too convincing. Opening night a front table was occupied by strippers from Third Street. They were very protective of us innocents in theatre. As the actor playing the cop approached the stage, Sunny (her specialty was tassle twirling) kneed him in the groin. The show did go limpingly on. The injured actor has since taken up Scientology. The actors and Joe shared the same butcher block in the kitchen – they, to make up; he, to make sandwiches. There was the night Joanna Vischer (Helen of Troy – and very much so) applied a slice of pepperoni to her cheek at the very moment Scotty delivered to a customer a rouge pad on a roll. I sat in the New Colony Bar on Greenwich Avenue with Edward Albee telling me, “I was too nice (since disputed) to ever become a playwright”. Nice meant as an euphemism for simple. My last play at the Cino was Pretty People. Nancy Wilder played Beauty Unadorned and Tom Lawrence gave his most articulate performance as the Looker. I remember a stupid fight Joe and I had over his plan to charge admission at the door. Equity opposed this, and to not put my actors in a spot, I canceled a revival of And He Made A Her. This was one of the last times I was in the Cino. I stood outside of it the night of Joe’s death, kicking the wall, too angry to cry, or crying too hard to harm much but my foot. I remember most the plays of Lanford Wilson, William Hoffman, Robert Heide, David Starkweather, Claris Nelson, Harry Koutoukas, Jean-Claude Van Itallie, Tom Eyen – I didn`t know the great fun of a Robert Patrick play until I produced one at TOSOS – they and Joe Cino and Johnny Dodd and Joe Davies and the others – all the others. The wonderful words, the laughter, the impossible made magic time by the ringing of a bell – that’s what I remember most. I remember everything but the dates. LANFORD WILSON and CLARIS NELSON laugh as I and DORIC get together for the last time at the former site of the Caffe Cino, 2007. MAGIE DOMINIC shares this image of “the view from Doric’s desk,” things he saw whenever he looked up from his writing.